I decided that for Dine Out Boston (what was formally known as Boston Restaurant Week), I'd eat (and Drink) at as many of Barbara Lynch's restaurants as possible via their "unofficial restaurant week". The only two I'm missing over the special two week period will be Sportello and B&G (which I have yet to try). I started my journey at No 9 Park. I'd heard from a friend that it is better than Menton, and I wanted to check it out for myself. It was a total splurge meal, even with the unofficial restaurant menu deal, but I thought it was a great experience. The ambiance was bright and cheery, and the vibe was modern and clean. I went with one of my friends and we decided to do it right and try the five course tasting menu with wine pairings and have a cheese course. The service was excellent as was the food. My only wish was that the pours for the wine pairings were a little larger because those were so tasty. We were seated at a two top and each got to sit on the booth-cushion on a corner of the table. This small detail made it easier to share food and conversation. 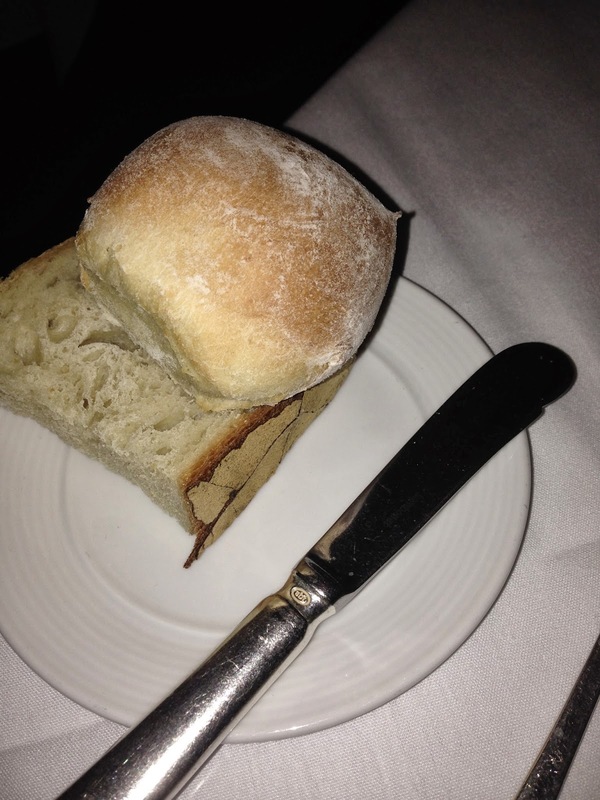 The meal started with two pieces of homemade bread. The roll was soft with a perfect sweetness and the slice of Italian bread was a balance of doughy and crusty. Both went nicely with the butter and salt we were given. I resisted the urge to get more bread because I wanted to save room for my dinner. 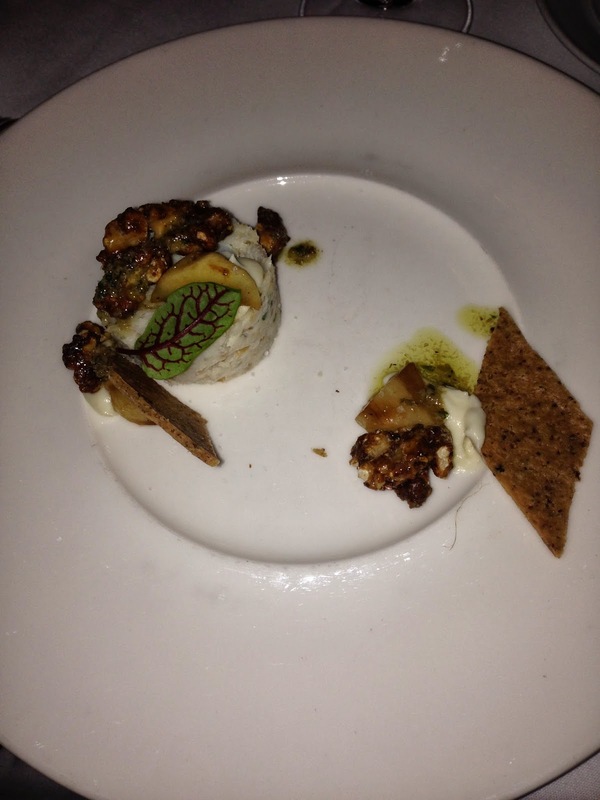 The first course to arrive was a (crab and) mackerel salad with parsnips tarragon and walnuts. I have a shellfish allergy, so the restaurant was accommodating and gave me mine without the crab and my friend had hers as was. It tasted like a higher end version of white fish salad but without mayo and went nicely on the homemade crackers that came on the plate. The roasted walnuts added a perfect crunch to the dish and the parsnips were roasted and sweet. 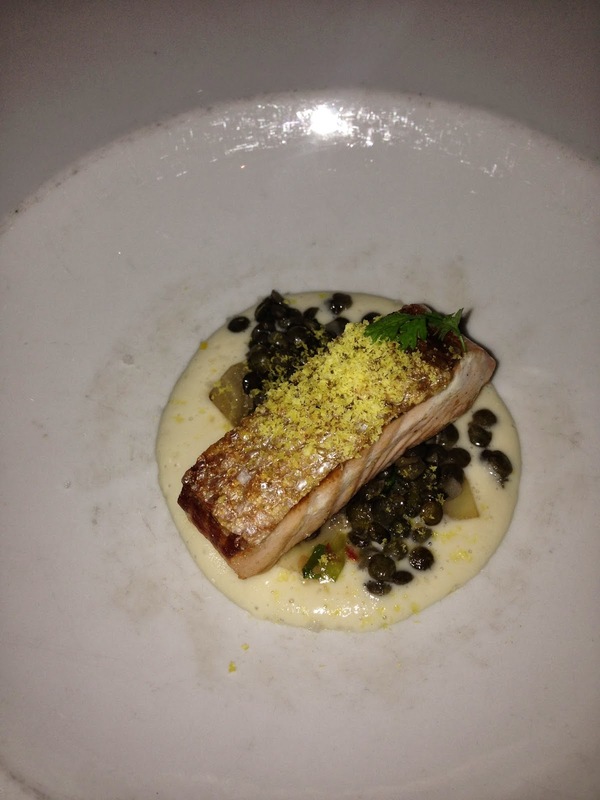 The next course was salmon with chicory and lentils. The salmon was moist and flavorful, served with the skin still on and the lentils made me feel like I was eating very healthfully and made the dish more hearty. 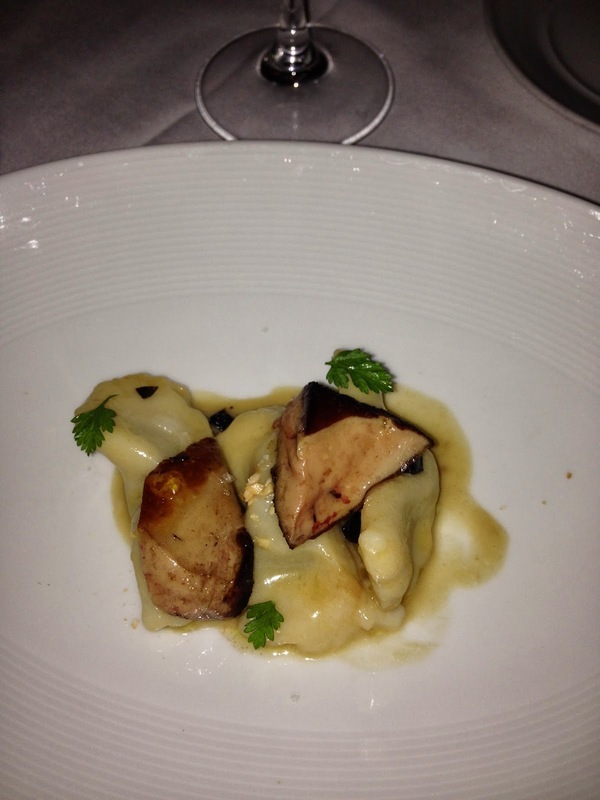 Course three was prune stuffed gnocchi with foie gras and almonds. It was excellent even though I am not a huge foie gras fan (hard to believe, I know). We were told by the waitress that this is Barbara Lynch's signature dish and I'm not surprised. The gnocchi was the consistency of wheat pasta with a sweet and umami flavor. It came with two pieces of sweet, cooked foie gras and more foie gras in the sauce. 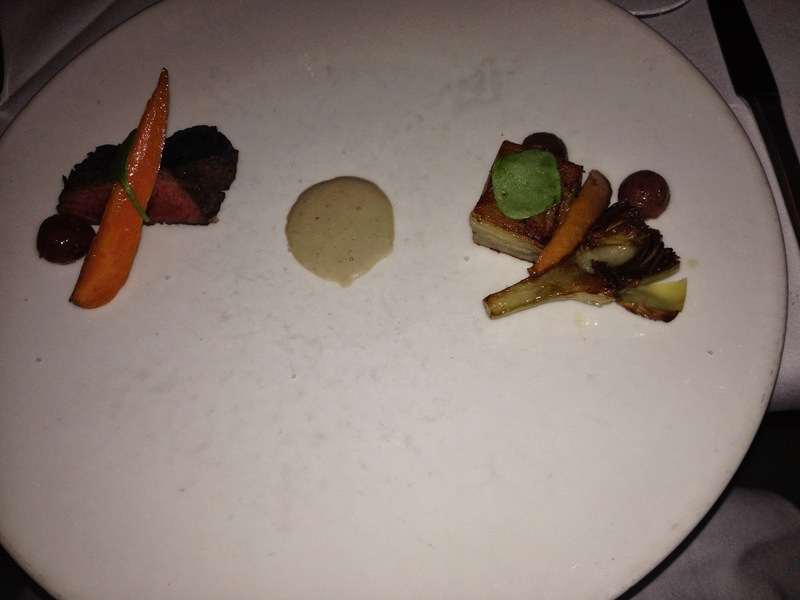 By the time the fourth course came, I expected to be full, but I was ready to keep going. This speaks to the excellent job the restaurant did with portions. The fourth course was a hanger steak with artichokes, bone marrow, a layered potato side and green garlic. The plate had my favorite things on it. I love nothing more than a good steak and artichokes-- this exceeded my expectations. The meat was cooked on the rare side and had excellent flavor that did not drown out the sides. Before the final course we experienced the cheese course. 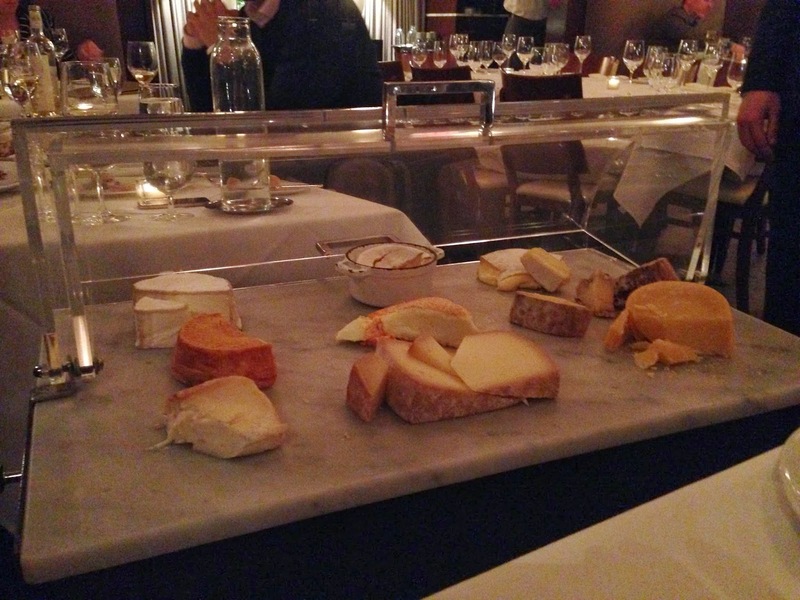 We had a specific person who knew a lot about the cheese walk us through our ten options. It was fun to learn about the cheeses and that about half of the board was from the US. I thought that most high end cheese came from outside the US, so I was happily surprised. They were accommodating of us wanted to save our appetite for dessert so we got two full slices and about three half slices of cheese. We had goat, cow and sheep's milk cheese and the cart was arranged in that order as well. 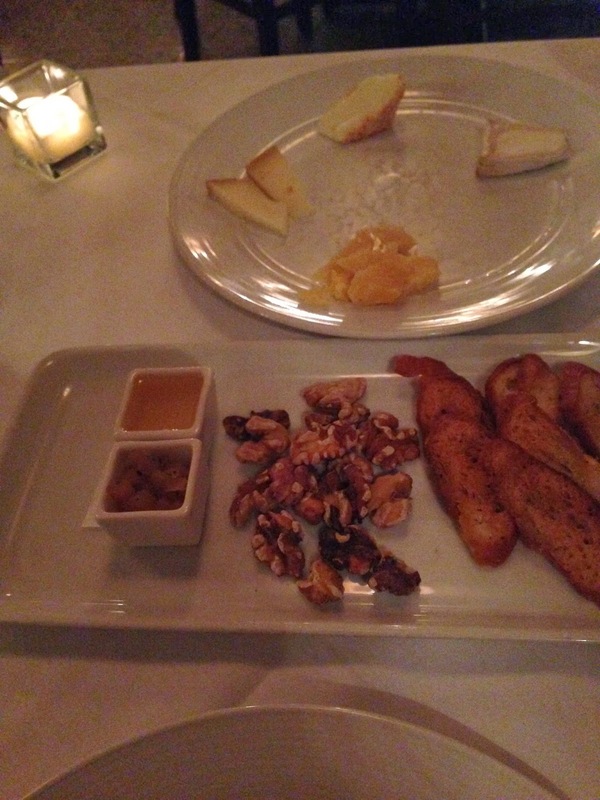 The cheese was accompanied by homemade toasts, honey, walnuts and some fruit. I enjoyed trying all of the parts together. My dining partner was more focused on just the cheese and she and I both enjoyed. We also learned that Formaggio supplies the cheese to No. 9 Park. Can't wait to take a trip to their store out in Cambridge to buy some of what we tried! Dessert came after the cheese and it was plated beautifully. Of the six courses, I was surprised that dessert was not my favorite. 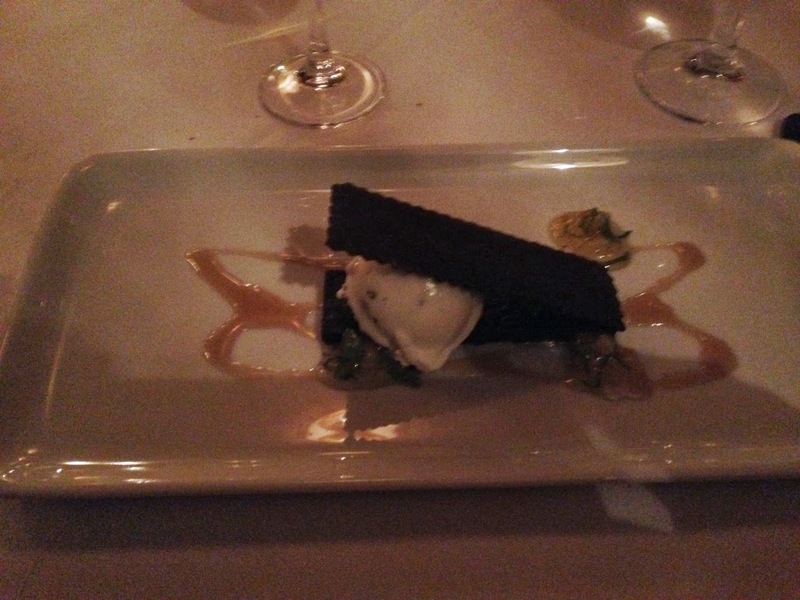 It was a rich dark chocolate rectangular cake with mint ice cream and lemon bourbon mint sauce and compote and a homemade "Oreo" cookie-like cookie on top. I loved the flavor of the chocolate cake and mint chip ice cream with a cookie on top, however I found the lemon and mint compote to be a distraction from the outstanding chocolate cake, ice cream and cookie. Overall, the experience was excellent! I would happily go back to No. 9 Park and recommend you save up and try it. The next time I pay them a visit, I'll probably try the bar as I have heard it's a different menu and there are outstanding cocktails. If you are comparing Barbara Lynch restaurants, it's a slightly more casual atmosphere and experience than Menton with the Italian flair of Sportello.